Nikken is a Japanese company created in 1975 with the aim of offering people an improved way of living. This is made possible through an idea known as Total Wellness. Instead of following the traditional approach of Western medicine focused on curing disease, Total Wellness emphasizes prevention - avoiding illness rather than curing it. This vision understands that Total Wellness depends upon the Pillars of Health - Healthy Body, Mind, Family, Society and Finances. Balance in all of these areas can help to produce a healthier, more satisfying lifestyle. I am an independent distributor for Nikken products supplying Water Filters, Air Filters and Sleep Systems, both for the home and workplace. These wellness products are designed to deal with everyday concerns, and be integrated into the healthy lifestyle concept known as the Wellness Home - an environment that supports the health and happiness of your entire family. The great benefit of wearing such products, or having them around your home, is that once you have them ... you just have them! It takes no effort to passively receive the resulting protection and benefits. The easy way to a healthy lifestyle. More testimonials can be found at the bottom of this page. If you would like to order any of the Nikken products below please call me or visit my online shop at My Nikken below. More than just another water filter, the Waterfall’s active mineral-enriching filtration system creates high pH water at low cost. More and more people today are talking about the benefits of higher pH (an abbreviation of ‘power of hydrogen’) water, sometimes known as ‘alkaline’ water. For many, it’s an essential part of their daily intake of liquids, that works to counteract the increased acidity of our modern diet. They believe that by attaining a good body balance, our overall health and wellbeing improves and that alkaline water helps restore balance, while also helping to defend your body against illness. The PiMag Waterfall takes its inspiration from the fresh streams of Japan, where the benefits of mineral rich, alkaline spring water have been known about for centuries. This is the idea behind the PiMag Waterfall. Its silent gravity, unique active-filtration system creates water with a higher pH level than any conventional tap or bottled spring water. Its unique streamlined design features a special water chamber where mineral enriched filtered water flows over specially sourced mineral stones. These come from just beneath the ocean’s surface, off the coast of a small Korean island and contain silicate class minerals. 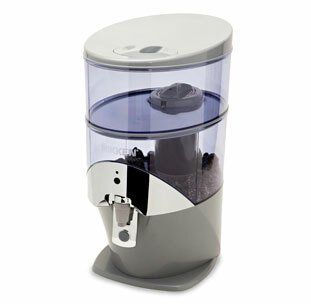 The active, recyclable filter offers multi stage filtration through a unique combination of ingredients. It all adds up to active purification and better alkaline water. The Waterfall has received the coveted Gold Seal of Approval from the Water Quality Association in the USA. This accreditation is only given to water treatment systems that meet rigorous standards for performance, capacity and integrity in removing a variety of drinking water contaminants. The Waterfall is designed to fit neatly on kitchen worktops – although, as it needs no electricity or plumbed-in water source, the Waterfall can be sited anywhere around your home. Its smart sensor knows when you’ve reached the 900 litre limit, when the LED filter life indicator located above the tap automatically turns from green to red, reminding you that it’s time to renew the filter. Enjoy the benefits of sunshine every day of the year, with the Nikken Kenko Light. Human beings depend on sunlight to thrive and stay healthy. and spending hours under artificial light is less than ideal for many reasons. Ordinary fluorescent or incandescent light bulbs operate in only a limited part of the light spectrum — not the broad, consistent range of wavelengths that the sun provides. The Kenko Light produces balanced, full-spectrum light similar to sunlight. It provides the wavelengths you're missing when you're indoors — and especially during the colder months. Research indicates that older adults who are exposed to light at the blue portion of the range (the wavelengths that are largely absent from ordinary lighting) sleep better at night. Other studies suggest that full-spectrum illumination may help in improving sleep and learning ability in adolescents. Because the Kenko Light helps support the natural sleep-wake cycle, it complements any lifestyle. The advantages of full-spectrum light can be enjoyed by everyone. And its advanced LED technology consumes less than 30% of the electricity used to operate a single 40-watt incandescent bulb. Bring the Great Outdoors into Your Home. An increasing number of people live in areas with unhealthy levels of air pollution, and indoor pollution is said to be worse than outdoor air. The dust and particles in your homes are a constant stress on your body every day. The Nikken Power5 can make breathing indoors more enjoyable because it combines advanced air filtration with negative-ion generation and aromatherapy technology. 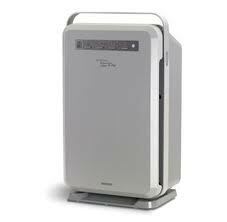 It's HEPA filter meets the standard used in laboratories and hospital operating rooms. More than a filter and deodorizer, the Power5 uses a patented process to create negative ions, like the air found in natural settings such as forests or near waterfalls. An exclusive Nikken technology, clean ion generation, produces negative ions without creating ozone. And only the Power5 adds a selectable aromatherapy system - a natural, non-invasive means of promoting wellness through relaxation and stress reduction. The Air Wellness Power5 is designed for fully automated operation, with sensors that activate it when changes in air quality are detected. 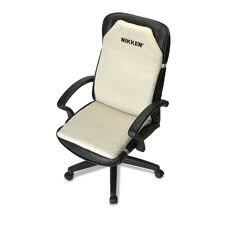 It is also supplied with a convenient remote control, and includes energy-saving features. With the Power5, you can experience the air you were meant to breathe, every day. The Nikken Air Power5 is endorsed by the British Allergy Foundation. The Nikken Sleep System is a unique range of complementary products hat are the result of years of extensive research by medical professionals, engineers and scientists. 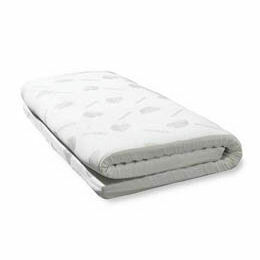 This complete sleep solution is compromised of three core elements - a mattress, quilt and pillow. 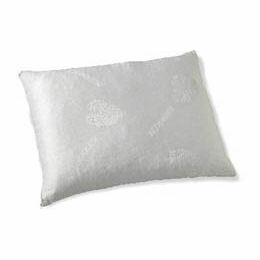 Each element functions excellently in its own right but they combine to give you the most advanced technology on the market today for better sleep. If you are having trouble sleeping, your eyes are often the first place to show it. Our pioneering " beauty secret" is designed to help you obtain deep sleep at any time - day or night. An important part of the Nikken Sleep System, the Kenko Sleep Mask effectively blocks out the light and ideal for a quick catnap or a deep restful night's sleep. The mask consists of a single, flexible magnet - you will benefit from the relaxing and energising effect of magnets as well as continuous balanced temperature and enhanced comfort through Far-Infrared technology. When your feet hurt, your whole body knows it. But thanks to Nikken Kenko Insoles, you can be relaxed and comfortable even when you are on your feet all day. Turn your shoes into an energising mobile massage unit with this innovative product. Kenko Insoles feature two layers - a textured, flexible, wear-resistant outer coating, and a specially engineered, reinforcing mesah with Nikken's exclusive magnetic technology. 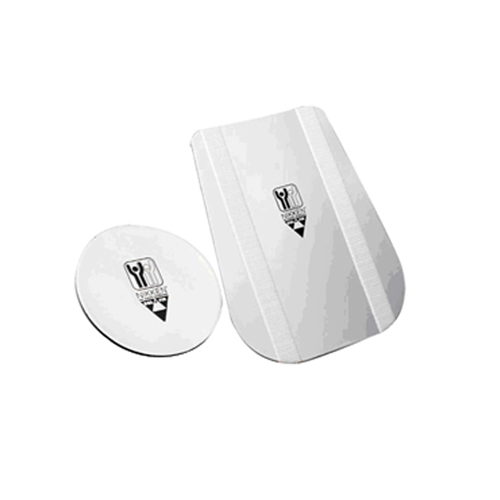 The insoles are reversible and come in three trim-to-fit sizes for both men and women. The TriPhase Sport Bracelet features Nikken Magnetic Technology, Far-Infrared Technology and Negative-Ion Technology within its core. The porous, permeable outer material “breathes” instead of acting as a barrier. Yet it’s strong enough to stand up to serious athletic activity. The pliable silicone is self-shaping to conform to your wrist. It’s so light, you won’t know you have it on — a plus for athletes who don’t want their golf or tennis swing affected by added weight. The neat magnetic clasp holds securely, but separates easily, eliminating any need to tug or stretch while putting it on or taking it off. The style and colors are equally attractive on men and women. Also new in, these beautiful bead bracelets incorporating Nikken technologies and available in four colours. Passive health benefits, like all Nikken products, but also looking great! From executives to lorry drivers, students or computer operators, today we spend more time sitting down than ever before. Designed with specially placed magnets and covered with 100% wool the Kenko Seat is ideal for home, office or car and comfortable in all seasons. Give yourself or others a relaxing magnetic back massage and experience the light rolling motion that gently sweeps from your neck down to the base of your spine. The balanced bearings flow in fluid motions for a fresh, invigorating feeling. 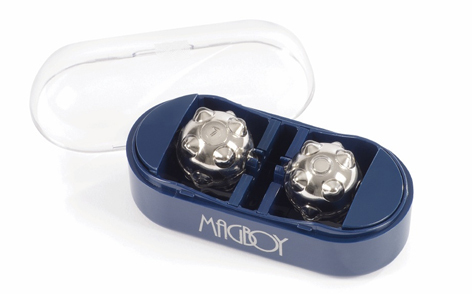 With the unique Mag Boy Nikken have taken the familiar concept of " stress balls" one stage further to create portable stress reliever with magnetic technology. Packaged in a convenient case, these sturdy magnetic balls feature specially designed nodules that refresh and stimulate your entire body. Whether you are watching television, taking a walk, or sitting at your desk, gently roll the Mag Boy between your palms or on any part of your body you experience discomfort or tension. Relaxation and stress-free technology - exactly where you need it most. 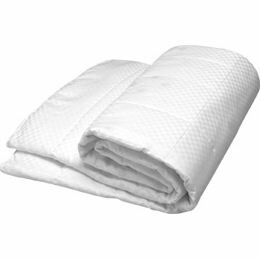 Kenko Relax Pads fit perfectly against your skin and feature EQL Magnetic and Far-Infrared technology to help sooth away those aches and strains. To order any Nikken products from me please visit my online shop here or call me and I can place the order for you. Please note: Our Independent Nikken Consultants do not make any medical claims. Nikken products are not medical devices and may not be recommended to treat specific medical conditions. People who are in their first 3 months of pregnancy, or who have a pacemaker, health problem or electronic device (either implanted or external) should consult their doctor or manufacturer of the device before using magnetic products. Do not place Nikken's magnetic products in direct contact with magnetically sensitive items such as watches, video and audiotapes, computer discs, credit cards and portable electronic equipment. Statutory Warning: It is illegal for a promoter or a participant in a trading scheme to persuade anyone to make a payment by promising benefits from getting others to join a scheme. Do not be misled by claims that high earnings are easily achieved.